Rigitone ceiling is the type of suspended ceiling systems, characterized by the features of the installation, the size of the sheets, and also useful properties. They represent an acoustic seamless structure made of perforated sheets based on gypsum. Rigitone boards are installed on the prepared profile frame structure, and the seams are closed with putty. A special putty for seams and a specialized tool are used for installation, as well as large perforated sheets, which have a sound-absorbing effect and a special manufacturing technology. Rigitone ceilings have a long service life of more than 50 years with all the requirements for their installation. In addition, perforated sheets of Rigitone have a fire safety certificate KM1, as they meet all fire safety requirements. The range of sound-absorbing sheets includes drawings with alternating, regular and irregular round and square perforations. 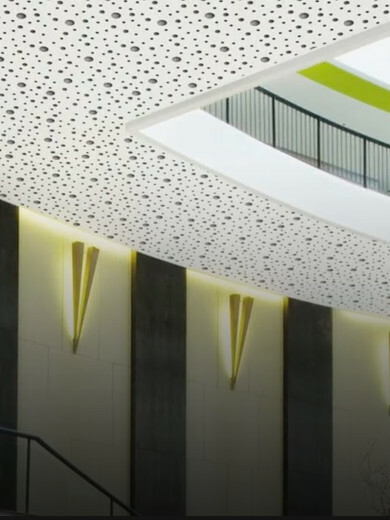 Combining lots of effective and decorative properties, Rigitone suspended ceilings are attracting attention of architects and designers increasingly to create unique and aesthetic designs. In order to improve suspended system acoustic characteristics sound-absorbing acoustic plates can be installed above decorative boards of Rigitone. They are laid between the profile frame system and the concrete base, due to which the acoustic properties are increased. It is used in low-rise and high-rise buildings, reconstructed and new buildings. It is mainly suitable for installation in spacious premises with special acoustics requirements. For example, in halls, hotels, restaurants, hospitals and other medical institutions, school classrooms and university audiences, as well as in office and administrative buildings, supermarkets and shopping centers, etc. When installing Rigitone boards, it must be taken into account that the humidity of the indoor air should not exceed 60%. It consists of a plasterboard sheet with round or square perforations, as well as a sound-absorbing non-woven membrane pasted on the back side. Rigitone ceiling system has many advantages, such as environmental friendliness, strength and durability. But the main function of Rigitone Air is to clean air from pollution. In addition, Rigitone ceilings have a seamless and unique design. The possibility of coloring and maintainability are also indisputable advantages. Optimal sound absorption is established and speech recognition is improved in premises due to special large-format decorative and finishing materials of the ceiling. Depending on the form perforated sheets for Rigitone ceilings come with square and round perforations of different diameters. There is an acoustic membrane of black or white on the back of the sheets. Rigitone sheets can be painted in any color unlimited times using a roller. In this case the acoustic properties of the material will not be disrupted. The spray usage is forbidden as this not only disrupts the acoustic properties of the sheets, but also spoils their aesthetic appearance.